Merry Christmas! Hope you enjoy my version of "Silent Night." A couple of months ago my friend Ford Heacock with Firebreath Media asked me to be a part of this fun 'lil holiday project he was putting together. The result is 10 eclectic and colorful Christmas songs by many talented artists (read more about them here!) - all yours for FREE!! But if you would like to give, all the proceeds will be donated to the Nashville Rescue Mission. Hope you'll check out my track, "Have Yourself a Merry Little Christmas," fea. Duane Borba on percussion and Laura Vance on background vocals. Thanks for sharing it with anyone you think would enjoy it! Here I am with Duane Borba recording for the holiday album at Firebreath Records. "I'll be Home for Christmas" - I've always loved this song. Something about the easy-flowing melody, the nostalgic lyric and the deep emotional content captured my heart from the start. Naturally, when I sat down with my guitar to play through the tune a few weeks ago, it poured out like it's always been in there, waiting for its moment. Being a musician who focuses on songwriting, I don't do a whole lot of covers - I only do the songs I really really really like - which is the way it should be, I think! My motivation for playing covers is 100% to perform it in my own style. The process for learning the cover is basically this: play through as much of the song as I possibly can without referencing sheet music or a recorded version, put aside any thought of the original rhythm and chord structure, and play what comes out. And that's exactly what I've done here! My hope is that you find it as fresh and unique as it is familiar and comforting! P.s. - If you have to be away from home for Christmas this season, or have had to in the past, leave a comment and share what you miss most! [soundcloud url="https://api.soundcloud.com/tracks/117798723" params="color=441b66&auto_play=false&show_artwork=true" width="100%" height="166" iframe="true" /] What’s your favorite or most meaningful Halloween costume you’ve worn? Mine has got to be the Hippie costume I wore in 5th grade, replete with seed beads, head scarf, rag purse and the tie skirt my Mom handmade when she was in her twenties. Although the costume was, in my opinion, fabulous, that’s not the only reason it means so much to me. My fun disguise reveals a poignant time of transition in my life: from girlhood to womanhood, the beginning of restlessness, longing and exciting discovery. I ached to be an adult without knowing what that really meant, of course. As with most adolescence, signs of my transition came in the form of many a frustrating remark to my parents. I remember changing into my costume at school before my Mom picked me up to take me to the ALL IMPORTANT CAN NOT MISS THIS EVERYONE IS GOING TO BE THERE Halloween Party. The not-so-logical part of my attitude was that I was embarrassed to be seen at school wearing a Halloween costume on (gasp!) Halloween of all days!! Oh travesty! I can hear my Mom’s confused and exhausted voice saying, “But Rae, you never get embarrassed. Why now?” I just sank further into my angsty frustration, trapped in the minivan as we headed to The Party, a place of anxious unknowns. What if no one else is wearing a costume? What if I stand out like a sore thumb? What if my costume is stupid and everyone else’s is cool? The toughest part about going through this transition stage is that everyone has a place on the social ladder at school. Mine happened to be just a nose hair above the lowest of the low. Here I was, so caught up in my internal conflict I didn’t notice that I was about to enter a place where the social playing field would essentially be leveled out. I mean, what does a costume do anyhow? It makes you become someone or something you’re not. It disguises your true nature. It transports you into becoming a silly whim or your deepest desire. I was heading towards a free ride with my peace-loving, hitchhiking Hippie Child garb on! But can you expect a hormone-enraged pubescent to think this clearly? So there I was at the Halloween Party awkwardly mingling with my gossipy schoolmates while getting a taste of non-parental guidance. And you know what? 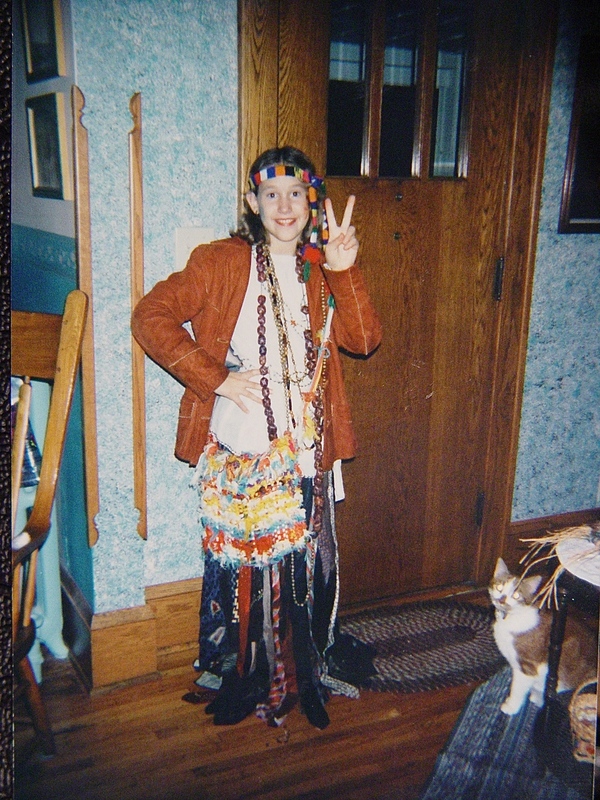 I have to say with shining honor that my (oh so embarrassing) Hippie getup won the Best Costume Award. Take that suckkkers!!! I can see the envy in all those parochial school girls’ eyes now as I received my prize, a Boyz II Men CD.